Glenn Ridge’s career in the broadcast industry began well before he became a household name in 1991 as host of Nine’s Sale of the Century, a position he held for over 11 consecutive years. Born in Adelaide, Glenn launched his career in radio and television in Bendigo in the late ’70s where he was a radio announcer for 3CV and the producer and host of weekly music video show Breezin’. Glenn formed his own production company which saw him produce and host shows including Six’s Super Saturday Show/’Off the Record’, 14 documentaries on Outback Australia, two Ford documentaries, and six series of The Car Show and The Boatique. A weekly children?s magazine show title Kid’s Only, produced and hosted by Glenn, won a Logie in 1986 for ‘Most Outstanding Contribution by a Regional Television Station’. 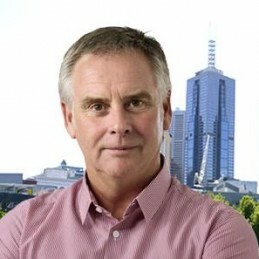 He is also a two-time recipient of the Television Society of Australia’s Certificate of Commendation. A motor racing enthusiast, Glenn has been a regular competitor for the past 20 years in a wide variety of motoring events including 17 Targa Tasmania tarmac rallies and six Australian Safari desert races.